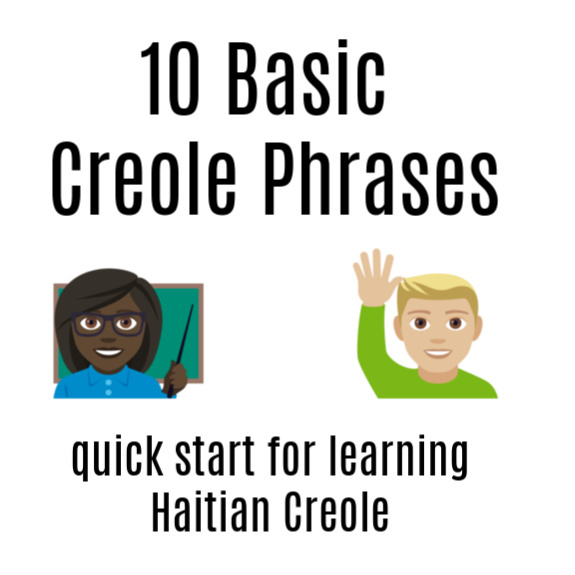 This conversation audio features the most basic Creole phrases and pronunciation. If you are new to learning Haitian Creole – start right here – Follow along to learn you to say hello, how are you, and what is your name. Scroll down for directions on making it stick. Mwen anfom. Kijan ou rele? I’m fine. What is your name? Mwen rele Steline. E ou? My name is Steline. And you? Oh Tony, mwen kontan fe rekonesans ou. Oh Tony, I am happy to meet you. Listen and follow along. Repeat at least 3 times or until you are comfortable. Read through the Haitian Creole phrases aloud, trying to match the pronunciations you heard. Listen again to check your progress. Write the phrases on flashcards (our print version coming soon). Practice them until you can go both directions without error. I.E. Creole to English and then English to Creole. Return to the audio on this page several times to make sure your pronunciation matches the speakers. Let us know when you’re ready for the Kreyol live test – we’ll schedule a time to talk on the phone with Estherline. Please leave any comments or questions below – we love to hear reader feedback!